No time for a long introduction! Grab your hat, coat, and thrashing-stick and come with me. 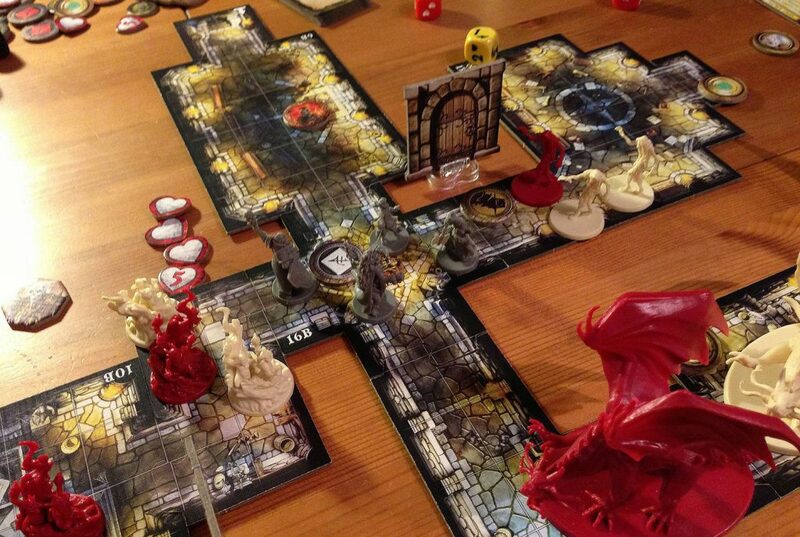 This time I maunder about some house rules the Gaming Chums use to ratchet up the tension and increase the complexity of games, and possibly to increase the conflict and turn the finest of friends turn into slavering killbeasts*. 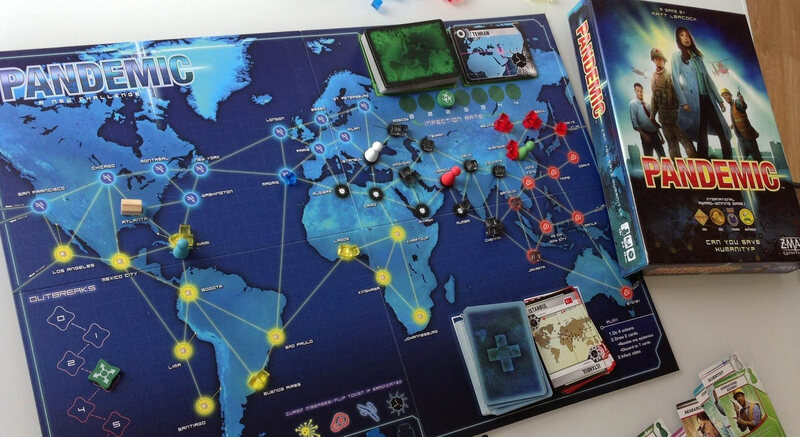 I have recently begun playing Pandemic with the Gaming Chums (Quinns, you scoundrel, it was all your fault). It is a rich and deep game, but intensive play has begun to revolve around the same successful strategies now that we’re more familiar with the game. Aha, thought I, the time has come to house-rule for complexity! The solution we have begun using is to restrict card-related communication and make it an action like moving, card exchanges, and the like, requiring players to make choices between acting and gathering information. A single action may be spent by the active player to send a message-of-text to another player (with whatever information and questions may be fitted into the typical 160-character length limit imposed by the medium) and receive a single response (containing anything the player desires that can fit into a single text) from that player. We also changed the Dispatcher’s special ability to be able to pay an action to speak a text-message’s worth of information and questions and receive a similar amount of verbal response from a nominated player, making the Dispatcher a powerful information dissemination role. The normal rules for card exchanges are slightly altered; Giving cards is not affected, but “taking” cards (with the nominated player’s consent, of course) requires speaking a location and disease to be specified, and if the player you intend to “take” a card from cannot satisfy one or both of those requirements the action is considered to have failed. This house rule acts as a little grit in the gears of a game whose steps had become a little too smooth, and suddenly the players are back where they were in the olden days of last month, struggling to hold back the tide of cubes, making agonising choices over how to spend the actions they have. Also the text communication is nicely evocative of a far-flung team of experts instead of chums chatting over a table. It is still winnable, but insufficient or excessive communication can result in global catastrophe. It is important to note though, that other verbal game-related communication is allowed and encouraged – nothing kills a gaming evening’s mood quite like sitting silently around a table watching people fondle their phones. If you fear your gaming group might not be able to handle the temptation to twit and book faces while doing so, you might replace texting with the passing of restrictively small handwritten notes. A slight aside to the above is that when playing Pandemic, we collaboratively name the diseases each game and write them on little paper labels that we hold down with the cure markers. In our last game, Red was Miley Cyrus impersonation, Blue was reverse diarrhoea, Black was wandering beard syndrome, and Yellow was the French unmentionable. At all times we insist on referring to the disease by name, not colour. Earl Grey attempts to cleanse the world of Miley Cyrus impersonation. Or perhaps he’s stealing the cure to ransom to the highest bidder. Never trust feline motives! Cosmic Encounter is a fine game, and when the port is flowing freely the Gaming Chums use it as a test bed for ways mix it up a bit to keep everyone on their toes. Dealing with the interactions between alien powers is the heart of the game, so our attempts almost always focus on that aspect. Our first success was to issue each player two aliens to each player and allow the player to switch the active alien at the end of their turn. An interesting variation on this was to issue each player an alien at random, then place a random alien card between each player. A player may swap their active alien for the alien card on either side at the end of their turn. In this way their old alien becomes available for the player on that side to claim in their turn, and sometimes alien cards can end up circling the table multiple times. Keep an eye on the Virus that crushes fleets with contemptuous ease, but fear the guy with the innocent-looking smile. Our more recent success is to allow the active player to discard his alien and draw a new random alien at the end of his turn, or choose from one of the previously-discarded aliens if he or she so chooses, which can cause a seismic shift in the balance of power in the game. 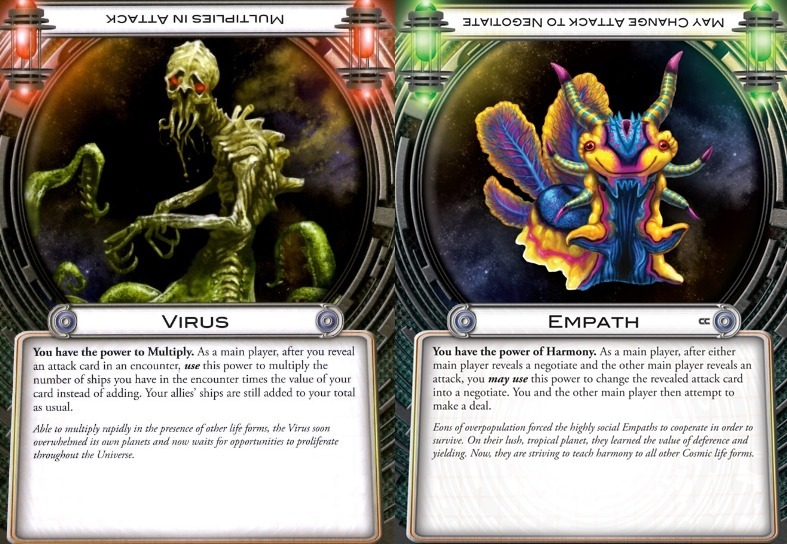 These games start out fairly normal, but a player using, say, the military powerhouse that is the Virus can only get away with it for a limited time – the Virus’s ship multiplier is helpless against the Losers, who turn defeat into victory, and the Empaths, who can turn a fight into a negotiation. As the game progresses, the pool of available aliens increases and an alien which was dominant a few turns ago can become a liability. Do you discard your alien because it is not ideal for the current situation? Or do you hold on to it because you don’t think you’ll be able to withstand it if it is held by someone else? The fact that the discarded aliens remain to be resurrected at any moment reduces the impact of the randomness somewhat as the game progresses, and it makes for the rapid formation and dissolution of alliances as the game landscape changes. 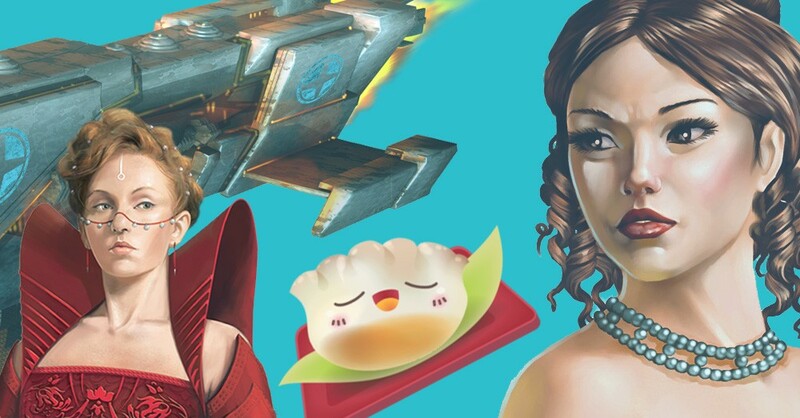 You might be able to tell that the Gaming Chums consider the highest art of Cosmic Encounter to be the ability to adapt to changing circumstances and form alliances on the fly. 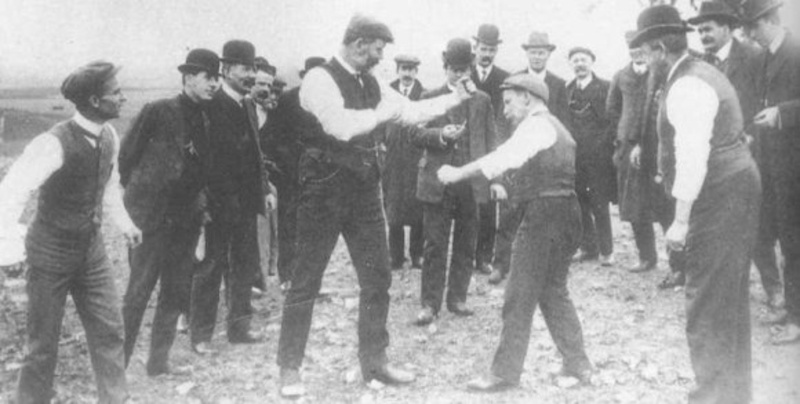 There is an age-old stand-by for making a game more cut-throat: Making the loss or gain of something valuable contingent on the outcome, which is to say, a gentlemanly wager. 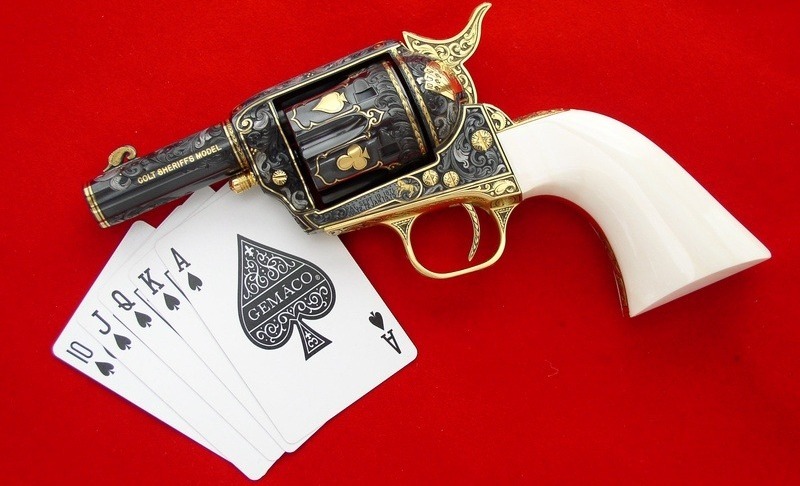 Poker in all its various lucrative incarnations is a mere trifle if one removes the element of the wager and the profit and loss which can occur throughout an evening, unlike, say, fizzbin**. 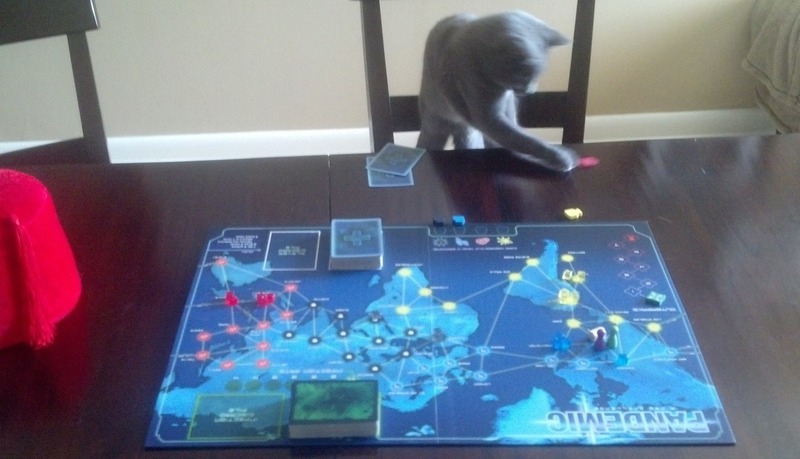 Money is beneath the notice of gentlemen (also ladies, and cats) so the Gaming Chums use other wagers. Before I go any further, I trust I need not belabour the point that in any game involving wagers of any sort, the rules, victory conditions, and stakes must be understood in advance by all parties, and that in the event of a dispute, a source of binding arbitration such as an uninvolved party must be sought? Also, while it is acceptable to taunt the defeated, the spirit of gamesmanship frowns mightily upon behaviour that discourages rematches and future game sessions. It is considered uncouth to announce your royal flush with indiscriminate gunfire. One of my first initiations into the honourable wager was Magic: The Gathering’s ante. At the beginning of play, a single (non-land) card was extracted from each deck, and the winner gained possession of both. I had friends who refused to play with ante, but I consider them misguided. The ante made each game feel more like it mattered in the grand scheme of things, and it became a tradition, and then after a while a house rule, to use cards won in ante as much as possible in the next gaming session against the previous owner, to both give them a small chance to win them back, and to taunt them for their previous loss. I faced several losses against a deck constructed solely to flaunt the Black Mana Battery that was once mine, and I responded in kind with the Royal Assassin I took from him. You might have heard of an obscure little science-fiction show called Firefly. I am given to believe it has achieved a certain degree of popularity. One nice touch that I observed was that in the episode entitled “Shindig”, poker was played not for money or score, but for chores. Chores that needed doing were placed on tokens and distributed to the players, and the final holder of the tokens representing each chore was exempted from having to perform that chore. I find that to be a particularly interesting variation on the traditional wager, as unlike cash, there is only subjective, and no objective, value placed on each wager. One player might consider the token marked “polish silverware” or “cleanse Earl Grey’s litter box” to be immensely valuable, while another who does not fear such a task (unlikely on the second example) might consider it to be a low-value token, and play accordingly. This sets up a rather interesting dynamic, where each player must not only evaluate their own cards and chances, but also weigh their personal evaluation of the current pot to establish their current playing stance. In the same way, now the Gaming Chums no longer actively play Magic we use Magic cards as tokens of value for wagering purposes, and each of us has our own opinion of the value of each card, by its rarity, condition, game power, artwork, and sentimental value. The Gaming Chums of course play for the pleasure and the honour of the competition, but at the end of each gaming session one participant is awarded The Fez in a solemn ritual that I may not speak of to outsiders. 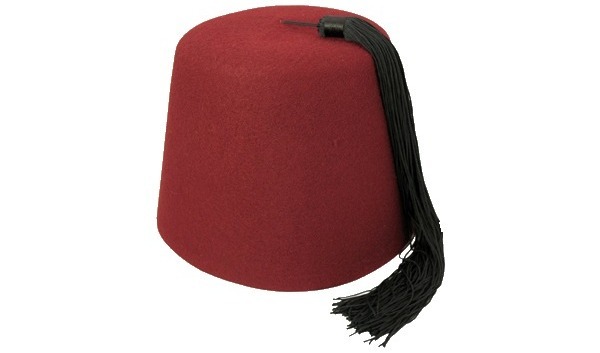 The Fez is the symbol of ultimate gaming prowess, and it goes home with the victor. At the next gaming session, the last winner of the Fez wears it proudly***, and is addressed as “Your Fezship”, and it is His (or Her) Fezship who determines the next wearer of the Fez, often by declaring a particular instance of a game to be a Fez Game. A Fez Game is always highly contested. Other times the Fez is awarded by decree from the Fez holder, for conspicuous gallantry or particularly impressive play. Next month: Something different. I shall play Mage Wars for the first time, without reading any the rules, and without recourse to a rulebook, against an opponent similarly ignorant, and report back for your interest and edification. Can we negotiate a set of coherent rules between us even as we play? Or will the entire affair devolve into a shambolic mess ending with pistols at dawn? I have no idea, and I intend to find out. *If actual killbeast transformation occurs, Smingleigh Super-Heavy Industries & Bakery assumes no responsibility. **But only on Tuesday nights. ***On one occasion the holder of the Fez did not bring the Fez, and earned the epithet “Fezless cur”.